The seed for Transition Fidalgo & Friends was planted in Spring 2006, when Skagit Beat the Heat was founded to raise awareness about climate change. 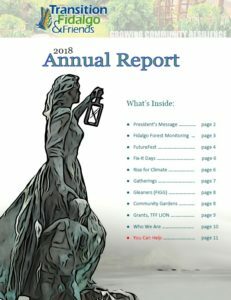 For nearly five years, Beat the Heat engaged the Skagit community through films, lectures, energy workshops, a global warming class, a community energy forum, a Climate Café, and other efforts. The group was instrumental in urging Skagit County to pass a climate resolution and establish a climate task force, and successfully encouraged the Skagit Council of Governments to hire its first resource conservation manager. Beat the Heat also established Anacortes’ first community garden and Eat Your Yard classes, published a community cookbook, Serving the Skagit Harvest, and the free guide, Living Well, Living Green in Skagit and Whatcom Counties. In order to expand the mission upon which it was founded, in 2010 Skagit Beat the Heat began the evolution into an official transition group, becoming Transition Fidalgo & Friends in 2011. TF&F is the 79th Transition initiative in the United States and part of a growing, global Transition movement.